Separated from the metropolis of the Los Angeles basin by the San Gabriel mountains, the Mojave desert valley appears barren with scattered desert brush, a few small hills and the odd Joshua tree. To the typical passerby it is nothing more than a desert wasteland. 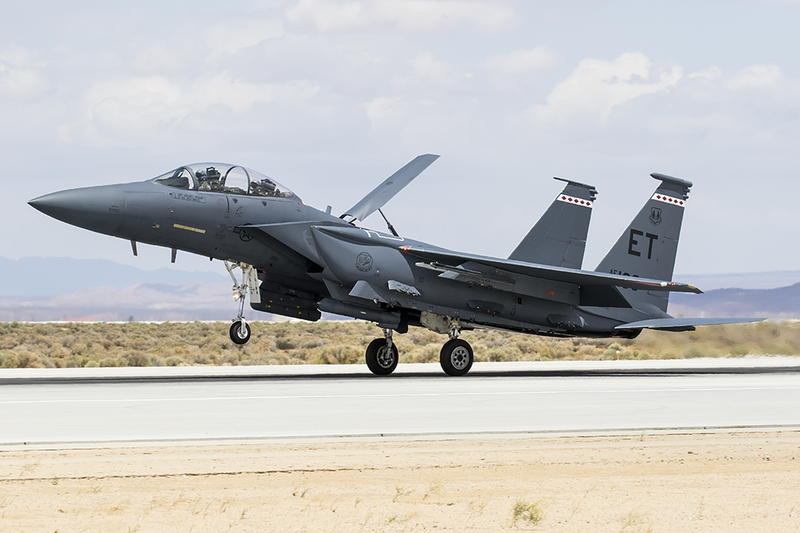 However, in the middle of the shallow valley cloaked by heat haze that makes distant structures invisible lay the historic Edwards Air Force Base. 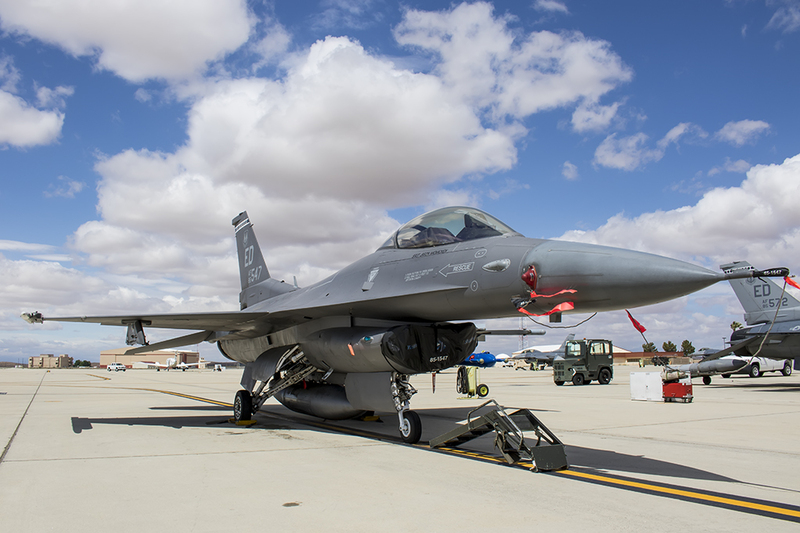 No Air Force Base evokes the history of the aeronautical developments of the past century, and the development of the USAF like that of Edwards AFB. To those that appreciate the development of aviation, space exploration, and advanced aerial weapons systems, this is hallowed ground. 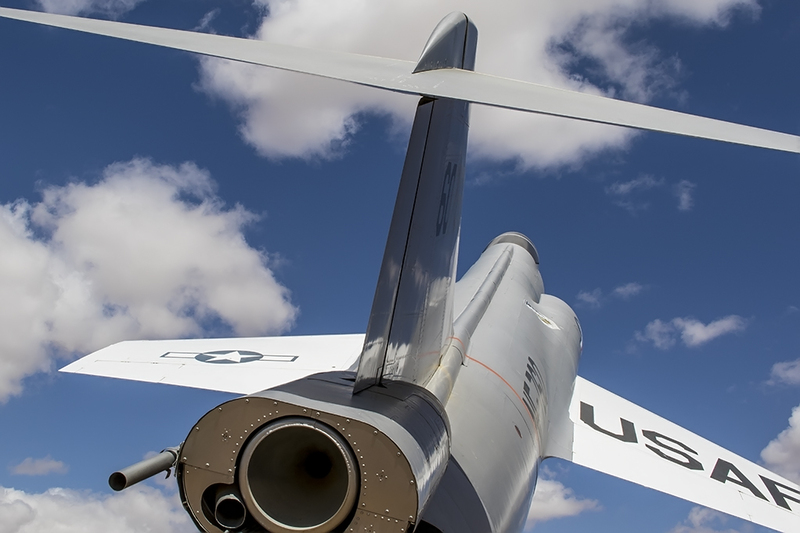 For the aviation enthusiast a visit to Edwards AFB comes with reverence, with the deeper sense of a spiritual experience. Edwards AFB (originally Muroc Air Force Base) is named after Captain Glen Edwards who died in the crash of the then experimental Northrop YB49 flying wing in 1948. It was this era of aviation that started towards the end of WW2 and ushered in jet power that vaulted Edwards to infamy. 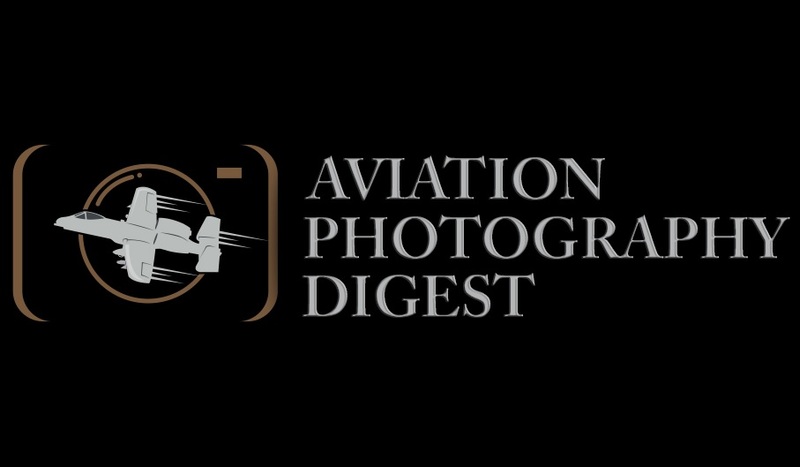 Many consider this “the golden age of aviation”. 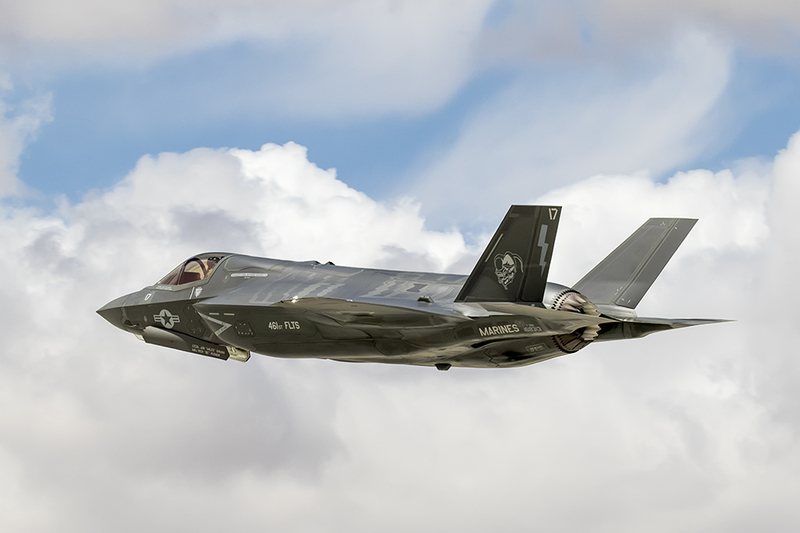 Aircraft designs were being introduced at such a rate that would make the development and release of the “Next Big Thing” look like it was moving at a snails pace. 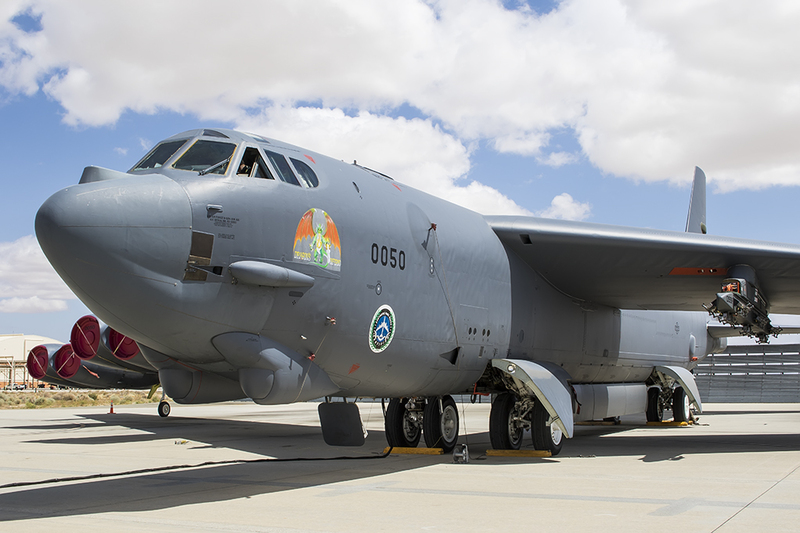 During this period through the ‘60s what seemed like an endless supply of new prototypes arrived for evaluation of flight worthiness and the flight line was littered with exotic research aircraft designed to probe the very limits of manned flight. The edge of flight and space were explored, as if in a 100 yard sprint. Yet as much as Edwards is the story of aeronautical and space development (data gained from lifting bodies and aircraft such as the X-15 that would find their way into the space shuttle), it is the story of the courageous test pilots who flew aircraft with unknown design flaws, or well beyond their flight envelope to discover the edge of that envelope. Those pilots climbed into the cockpit not knowing if they would return safely, and many did not. Regardless, they eagerly kept climbing into those cockpits. Today, when one visits Edwards it is hard to miss the dynamic history of accomplishments, now captured at best in static display. Behind every display lay scores of worthy stories. 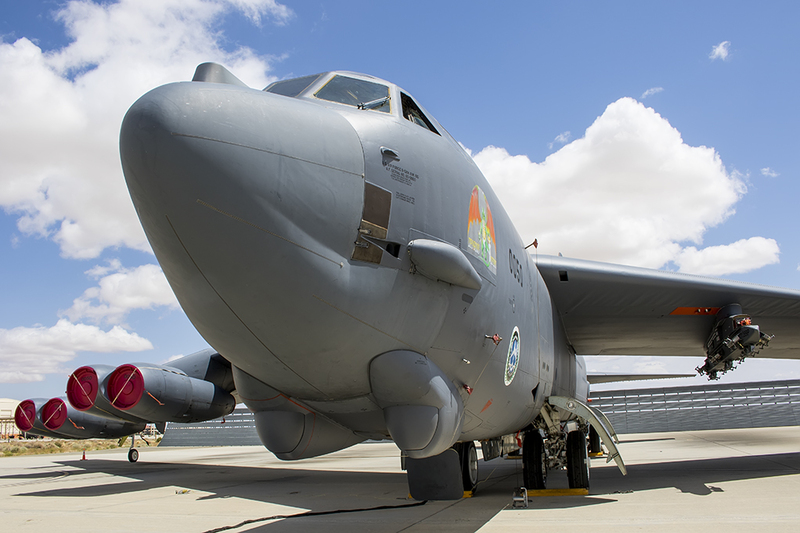 At the North Gate sits the most famous of all B-52s, a B-52B “Balls 8”, its fuselage covered with historic mission markers like “kills.” To the West is Century Circle, a tribute to the development of the century series of fighters. Just inside the gate one finds the Edwards AFB Museum, which holds unique aircraft and memorabilia, with plans to develop into something larger that will preserve more history. 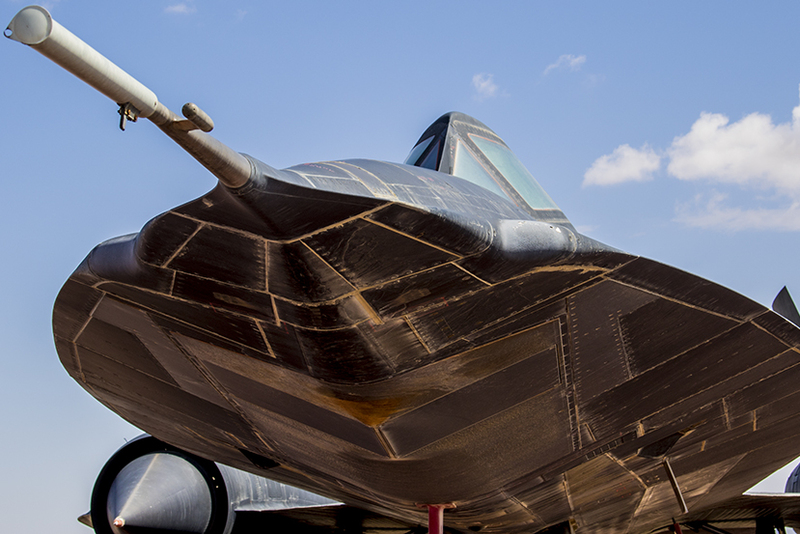 Throughout the base stand a variety of history making aircraft. 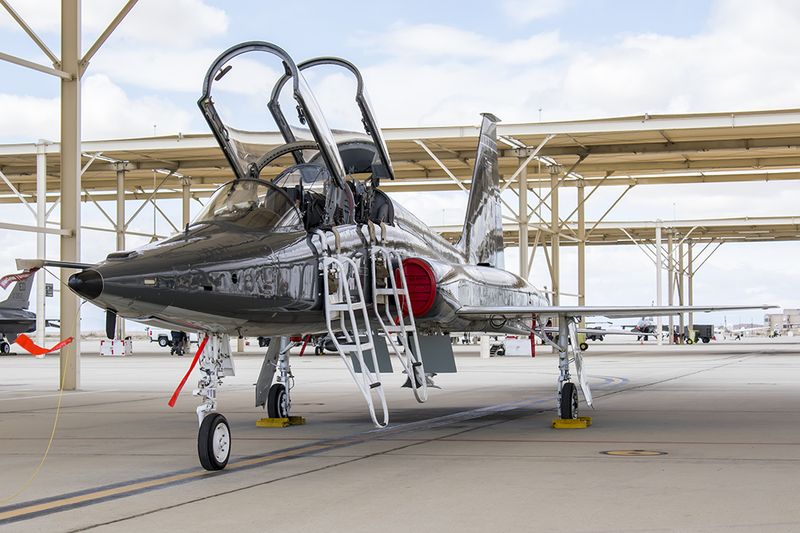 The NF-104 used to train astronauts is pointed to the stratosphere, and a variety of other aircraft used by NASA to evaluate new wing designs, alternative control systems and exotic engines, including the last SR-71A to fly are nearby. 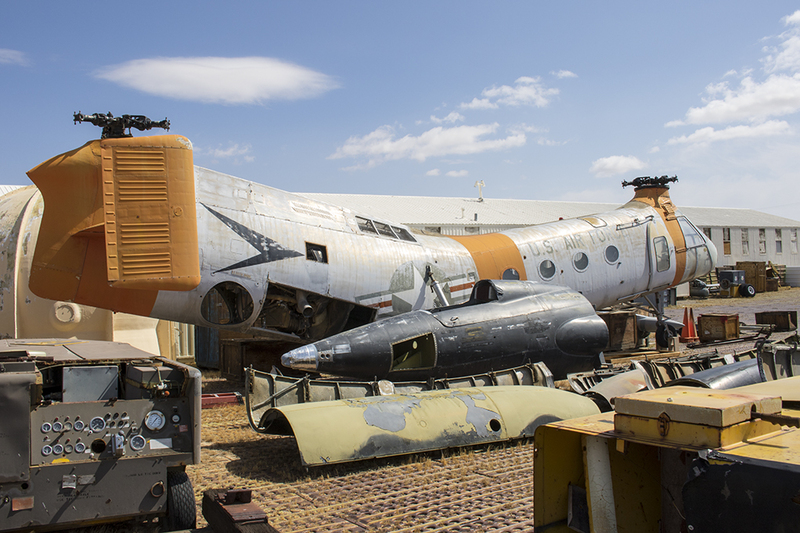 For the seeker there is a salvage yard with a variety of aircraft remains, and a ramp area filled with historical aircraft waiting restoration and their ultimate destination in the planned museum relocation and expansion. One cannot help but feel these aircraft have souls, and wish they could talk as in the Disney movie “Planes”. Edwards history provides the foundation for current activity. 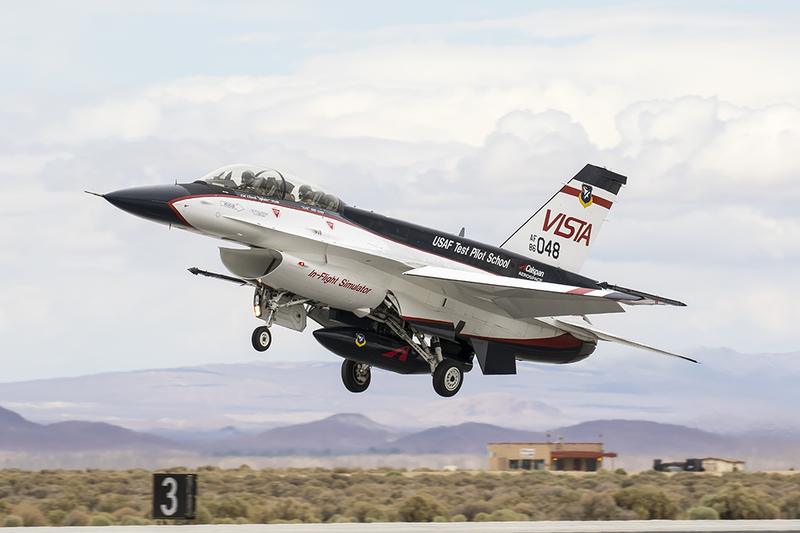 NASA continues their work at Edwards as the “NASA Armstrong Flight Research Center“. 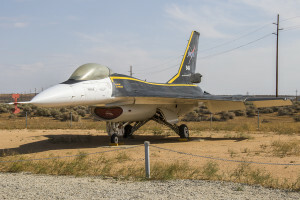 The Air Force continues to use Edwards as the home for the Air Force Test Center, Air Force Material Command, and the USAF Test Pilot School (TPS). The testing has evolved with every aspect captured by sensors and carefully analyzed on computer. 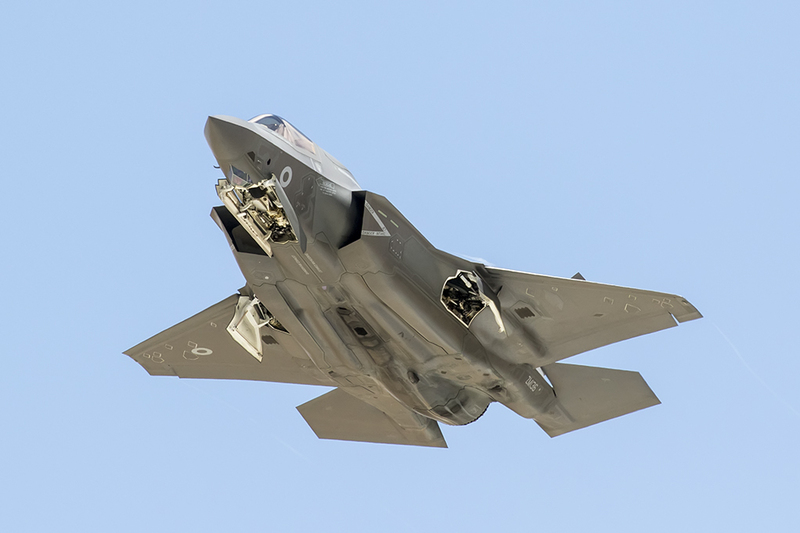 Millions of lines of software code replace physical flight systems, and bring their own new evaluation and validation challenges. 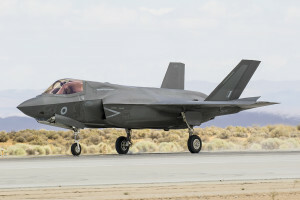 Pilots in the TPS deal with the simplest aircraft, and with those where computers allow flight characteristics of a given platform to be dramatically altered. 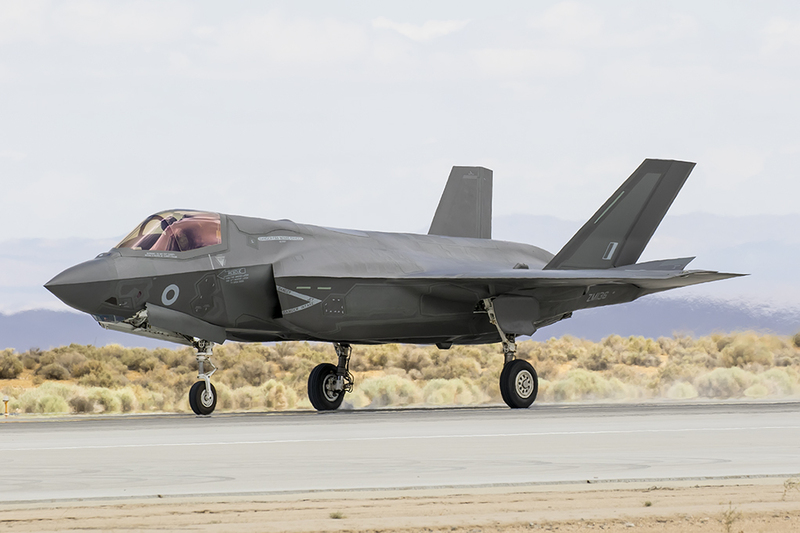 RAF F-35B (ZM136 / BF-16) rolling it out after short landing roll at Edwards AFB. 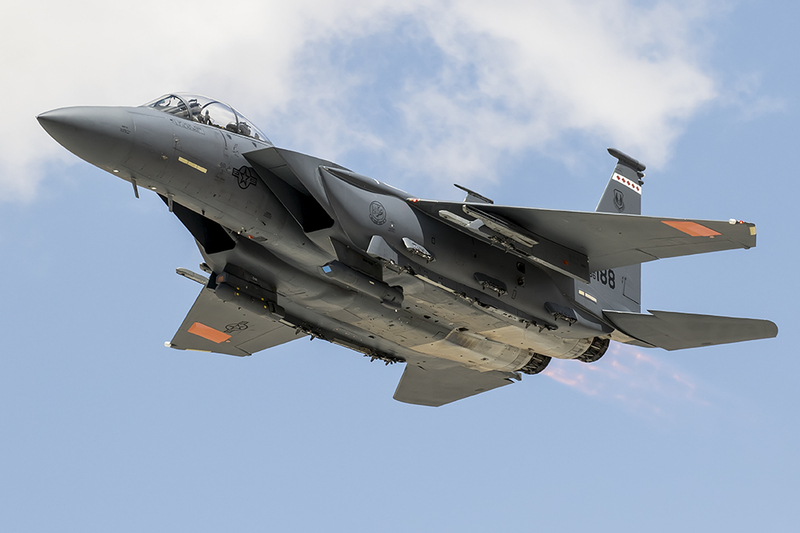 The latest and greatest aircraft fly with the greatest of attention in stark contrast to the cutting edge aircraft of yesterday that now sit abandoned and badly weathered. The roar in the skies overhead draws one into the present, eyes skyward twisting and turning aircraft at altitude remain hard to find. 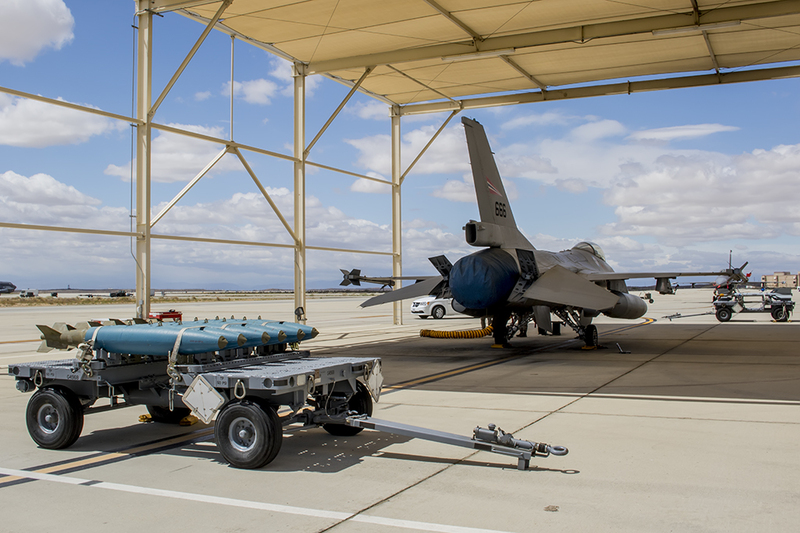 They speak to another reality of Edwards AFB. Behind closed doors and unseen deep within the bowels of Edwards there are plans well underway for the next aircraft arrival at Edwards, the next systems test, the next subtle or significant breakthrough that will keep our nation’s Air Force well ahead of global threats in both design and operational capacity. 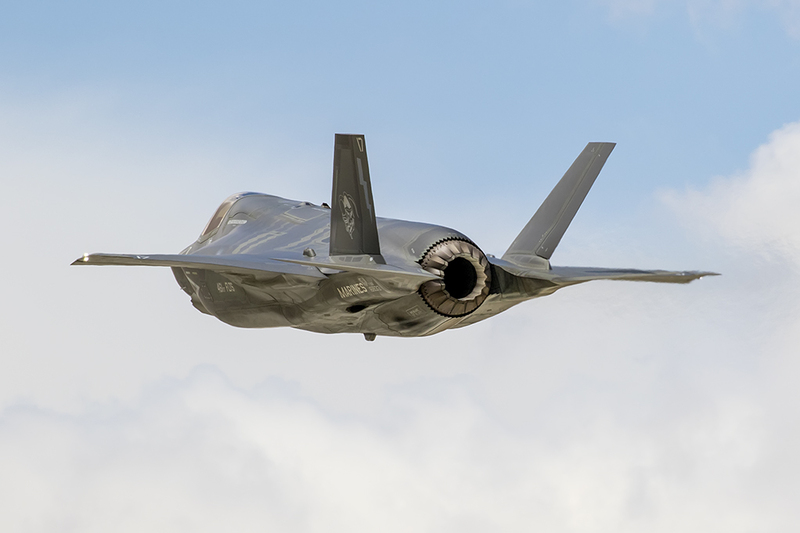 People can’t help speculating, is it the new UAV (the RQ-180), an SR-72, or the LRS-B – which some believe is already flying? If you want to know what is next at Edwards, just take a look back… whatever it is, it will be cutting edge, and pushing the envelope. It’s Edwards, and history is just around the corner. 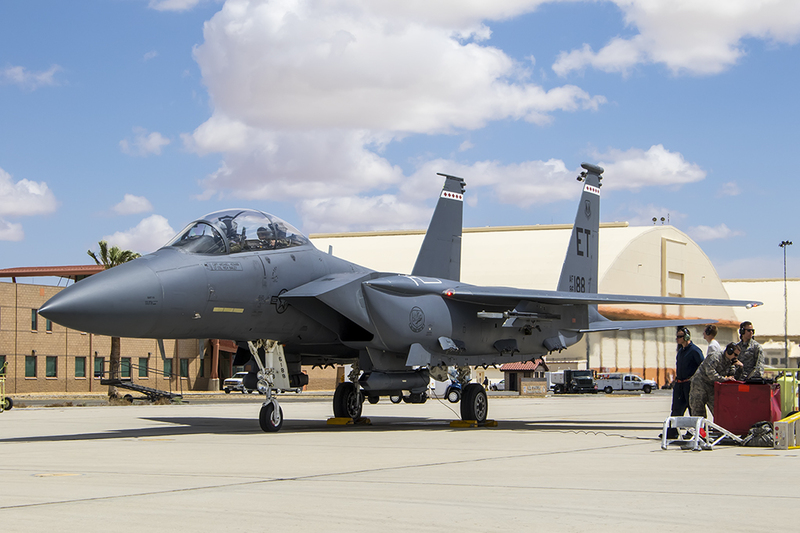 Special Thanks to John Haire, Chief of Public Affairs Operations, 412th Test Wing. 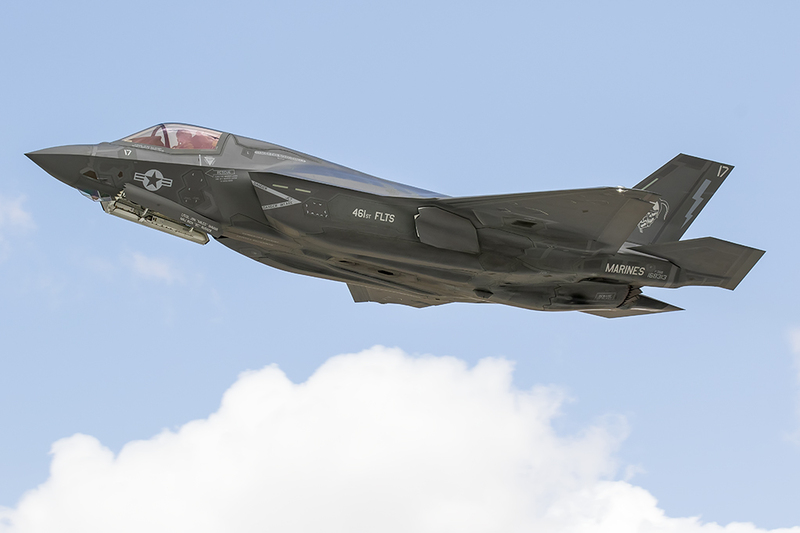 F-35A from the 422d Test & Eval SQ winds down after landing. 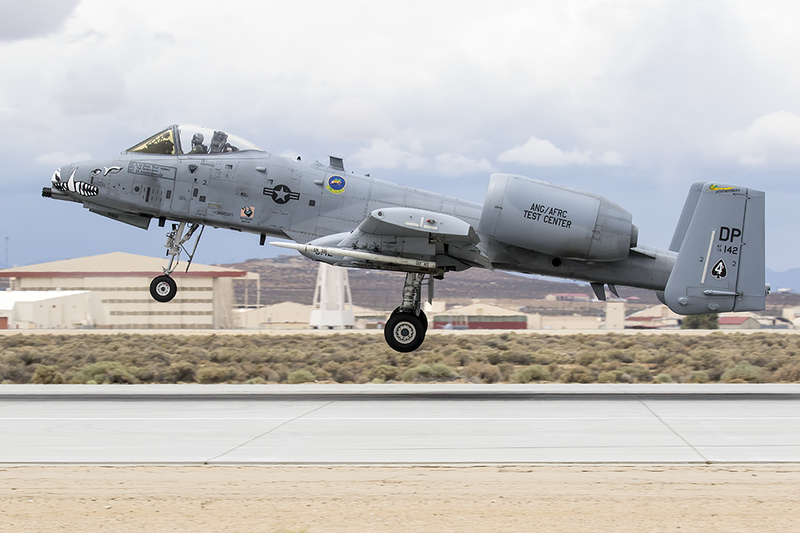 Fairchild Republic A-10C Thunderbolt II USAF 79-0142 47th FS DP "Dogpatchers" AFRC Davis-Monthan AFB, AZ leaves the runway at Edwards AFB. 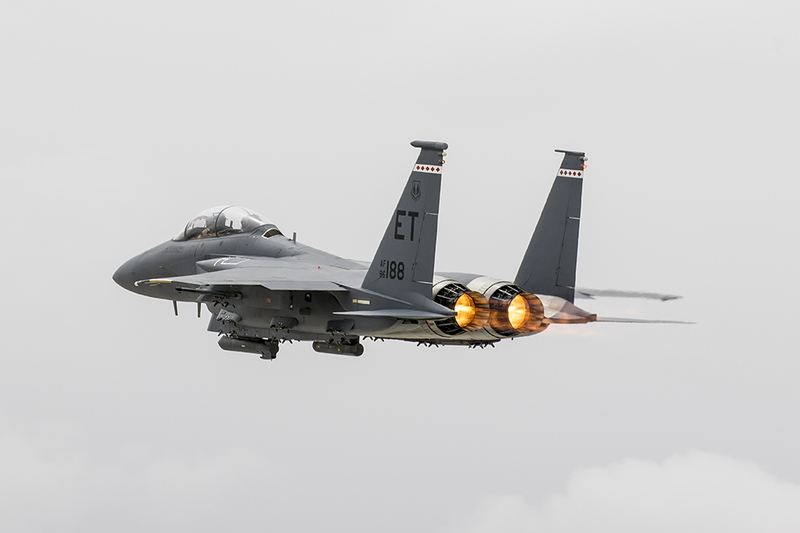 Eglin F-15E launches into gray skies at Edwards AFB. 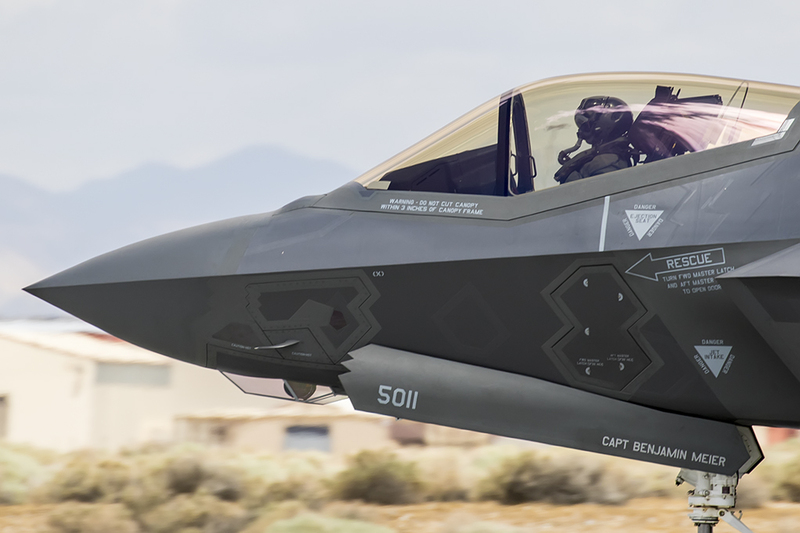 F-35B USMC assigned to the 461st FLTS at Edwards AFB departing under military power. 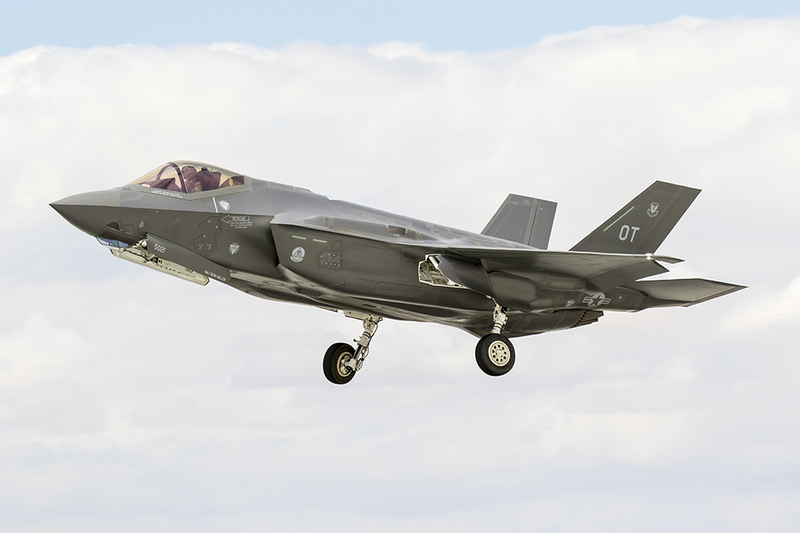 F-35A from the Operational Test (OT) group departs the Edwards runway in burner. 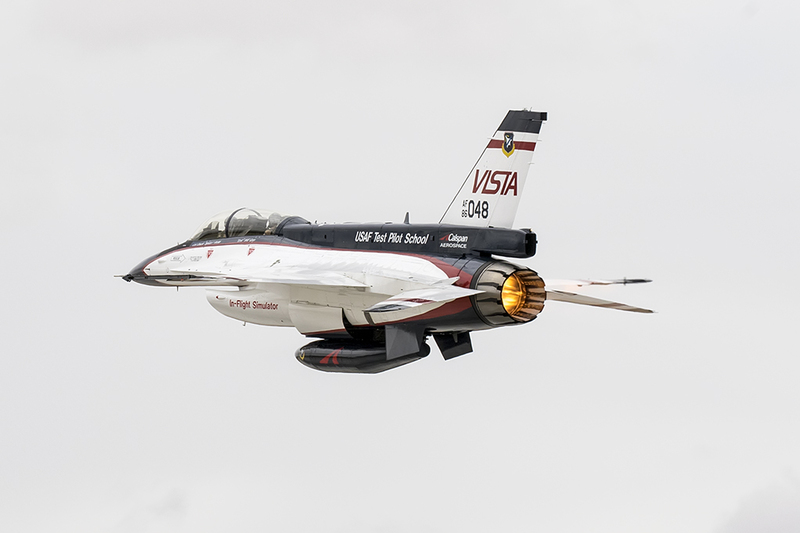 The flagship of the US Test Pilot School, the F-16 VISTA (Variable Stability In-Flight Simulator Test Aircraft) takes to the air. The VISTA can be programmed from the back seat to fly like an F-16, a delta wing aircraft, even a cargo plane, making it a tremendous tool for educating test pilots. 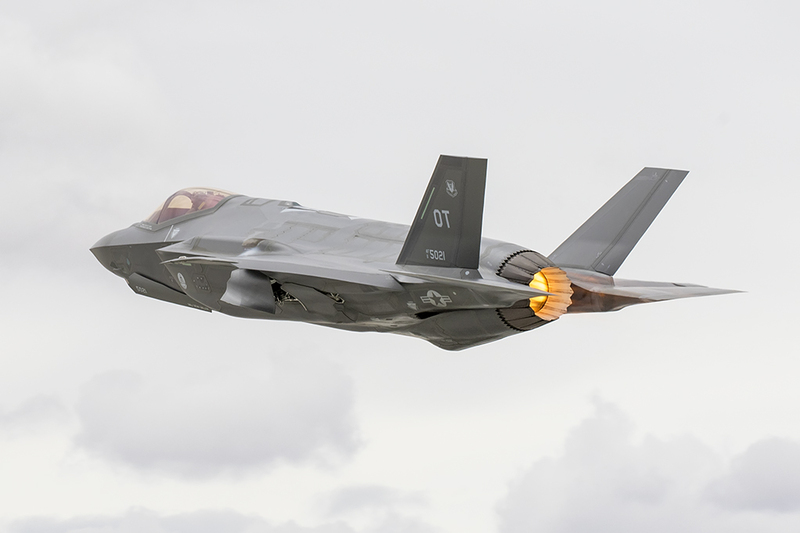 F-35A from the 31st Test & Evaluation Squadron with mains folding away on takeoff. 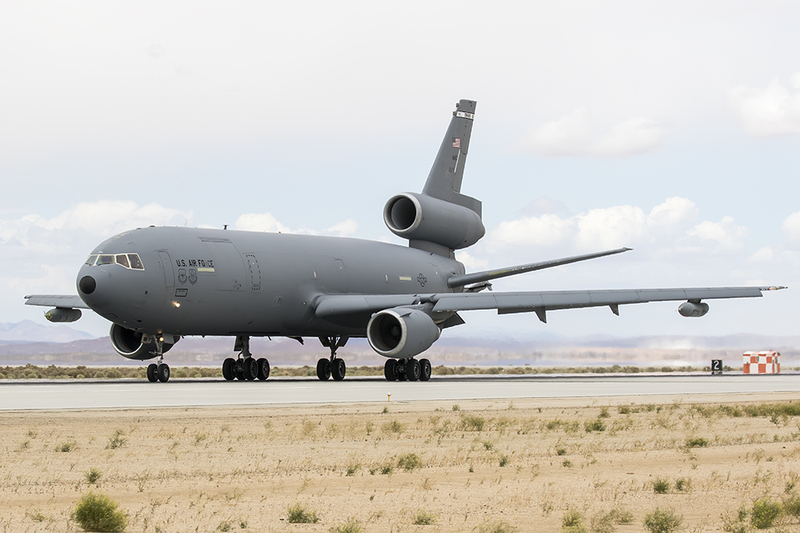 Travis AFB based KC-10 lands after a number of touch and go's at Edwards. 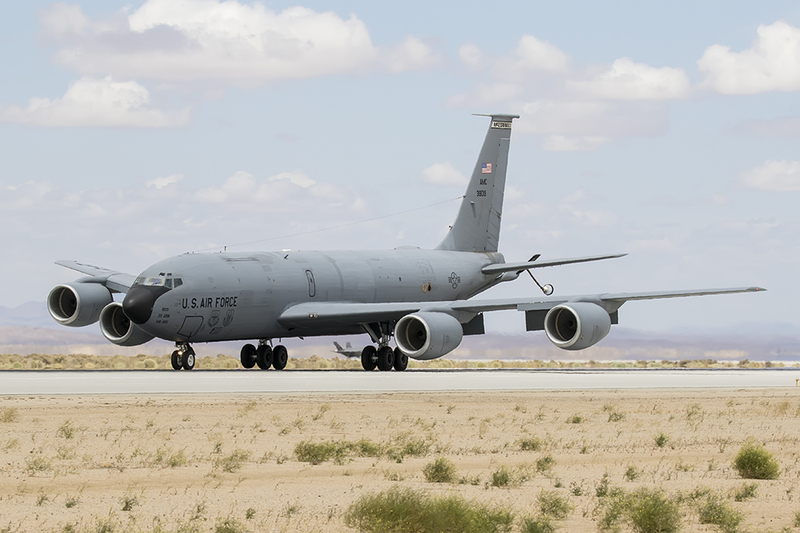 KC-135 Tanker features hose & drogue refueling to support F-35 flight testing. 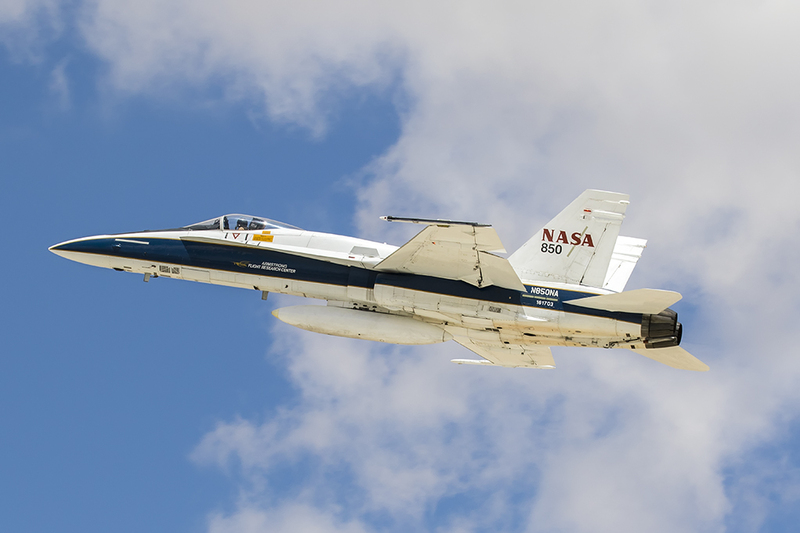 One of two single seat F/A-18s flown by NASA at Edwards AFB. 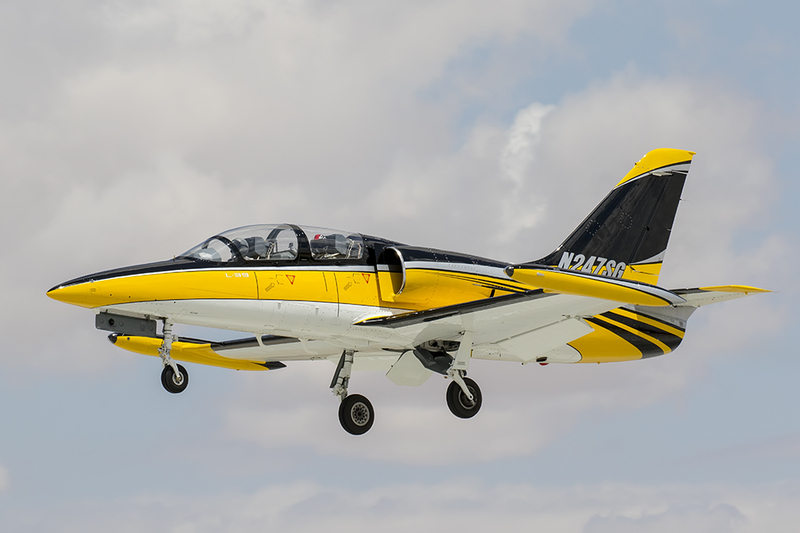 The aircraft are used for for research support (chase planes) and pilot proficiency. 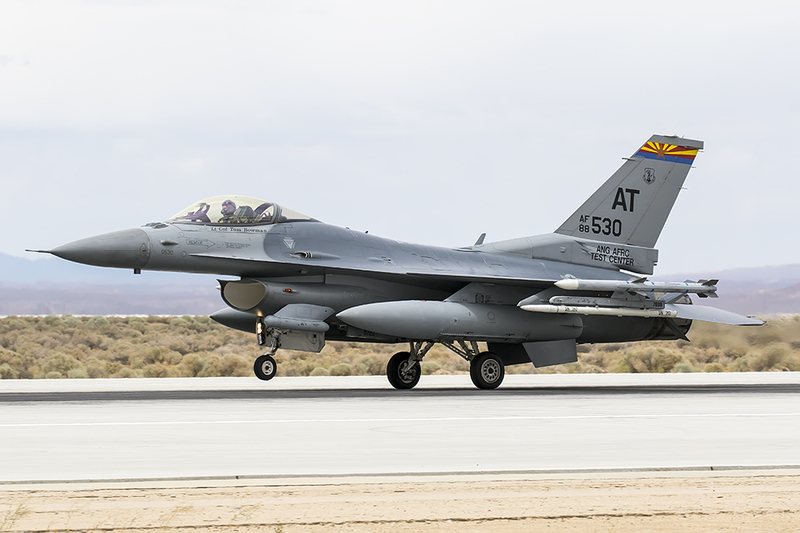 RNoAF Fokker F-16A Block 20 MLU assigned to the USAF 416 FLTS (80-3666). 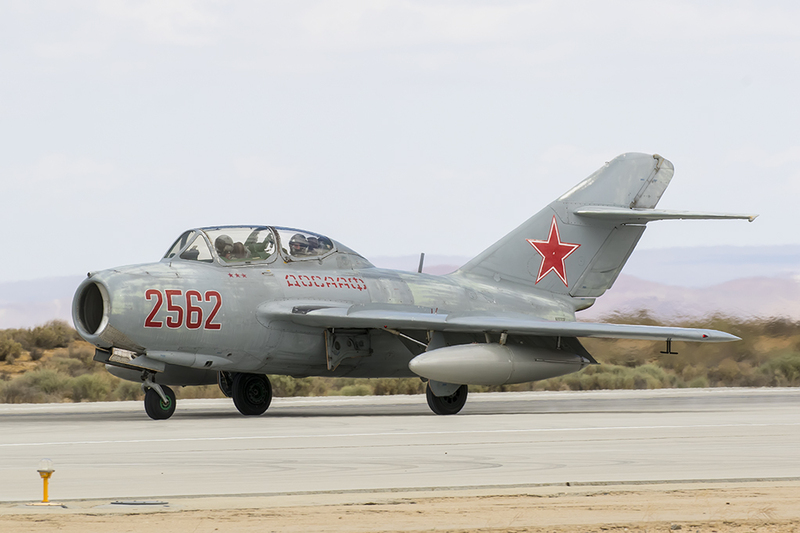 Mig-15UTI that belongs to Red Star Aviation, and is made available for the US Test Pilots School. The business end of the NF-104 used to train astronauts and pilots for X-15 & X-20 flights. Maximum attained altitude -120,000 ft. 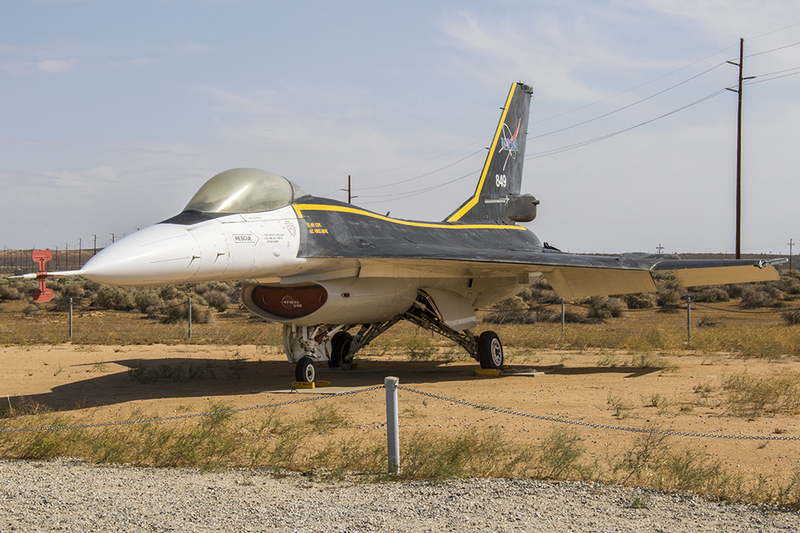 The Parts - Boneyard at Edwards AFB. 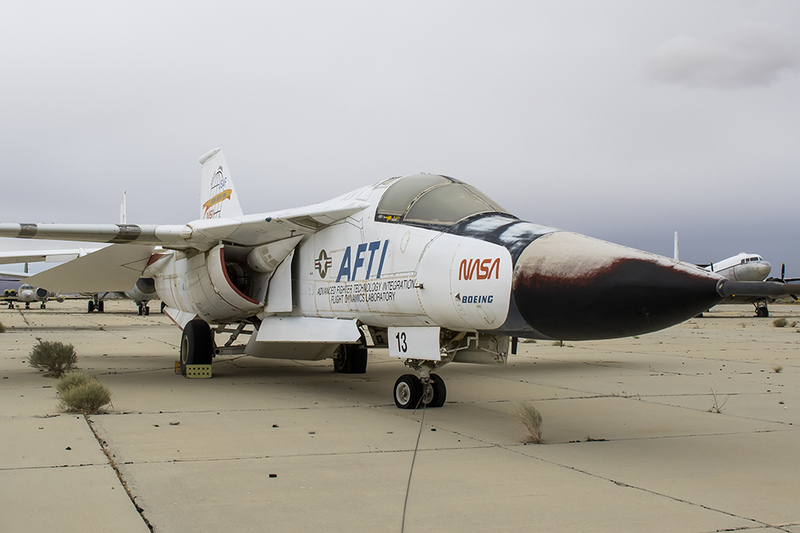 Once a cutting edge demonstrator for a supercritical wing, a mission adaptive wing, fly by wire and more - this F111A now sits among other history makers waiting for restoration. 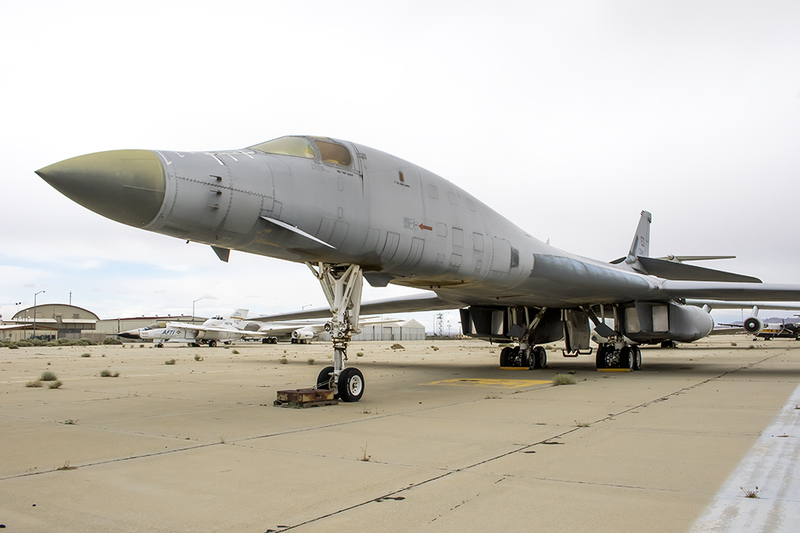 B1B 84-0049 "Thunder from the Sky" once setting numerous world records in the skies over Edwards, now sits on the ramp waiting for restoration and a spot in a museum yet to be built.